Discover the facts, myth, history, and mystery of the spiritual art of Tarot-reading. Whether you want to learn to read the cards or deepen your Tarot interpretation skills, The Ultimate Guide to Tarot honors the deep heritage of Tarot, while guiding you through practical techniques. 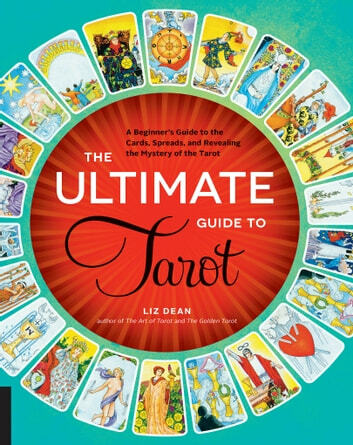 Tarot expert Liz Dean offers an overview to all of the important elements of each card from symbols, to links with astrology, kabbala and numerology. The Ultimate Guide to Tarot also includes all the classic tarot spreads – Celtic Cross, Horseshoe, Star and Astrological Year Ahead – plus, a mini-layout to try for each of the 22 major cards. Learn how to combine the three essential ingredients of a great tarot reading: knowing the meaning of the cards, how to lay them out, and trusting the intuitive messages the images often spark within us during a reading. This synthesis is the true magic of tarot. With the authority and confidence this book offers, The Ultimate Guide to Tarot will be the must-have companion for beginner readers and tarot aficionados alike.